Fortress Of Freedom Board :: View topic - Good Luck To Gil Moore And Triumph! Good Luck To Gil Moore And Triumph! Posted: Mon Apr 07, 2008 10:18 pm Post subject: Good Luck To Gil Moore And Triumph! A big congratulations To Triumph for being inducted into the Canadian Music Hall Of Fame at the Juno awards (April 6 in Calgary) and "good luck" on a possible North American Tour next year! Of the group, Mike Levine - Gil Moore and Rik Emmett, Gil Moore is the only one I truly know. Gil is the guy who owns Metalworks and he knows me very well as I helped him pay many bills in the 2005/2006 years (but I did get nice personalized thank you notes with the receipts.....hehehehehe.....). 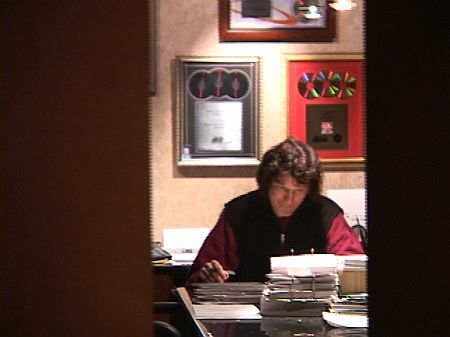 Gil Moore in his office with awards filling the walls! I really am not the kind of guy to name drop but I did see this guy regularly over eight months and he was sometimes my "unofficial" door man when I locked myself out or needed someone to hold the door as I trucked all my video gear in.....hehehehehehe..... Word has it that they will be touring again next year. So a big FOF congratulations and good luck to Gil and the rest of Triumph!